Chronic Feline bad breath clinically known as feline halitosis, can be a sign of diabetes, periodontal disease or other cat health problems. Even though it’s natural for your cat’s breath to smell like the meal they just consumed, which often has a strong and not always pleasant scent to humans, consistent foul bad breath could be the sign of a serious underlying problem that needs to be checked by your cat’s veterinarian. One of the most common causes of feline bad breath is poor dental hygiene, which results in the build up of plaque and tartar. Plaque occurs when minerals, bacteria, and the food that your cat consumes are combined and are left on their teeth. Bacteria quickly multiplies in the mouth, which then results in a foul smelly breath. Plaque and tartar can easily accumulate over time without proper dental hygiene and can be very difficult to get under control without the help of a veterinarian. As a result of the excess tartar and plaque build up your cat’s gums may become inflamed which sometimes causes bleeding during feeds, which can actually attract additional plaque. Another cause of feline bad breath is parasitic infections. Worms or parasites in the intestines display many symptoms including gas, diarrhea, fever, fatigue and irritability. Parasites sometimes grow in cat's stomach as a result of partially digested food or an improper diet. The partially digested food can cause a foul odor in their stomach, which in turn creates bad breath. The parasitic infection will have to be treated in order to get rid of the offensive breath. Feline bad breath can also be caused by diabetes, or several diseases including skin, respiratory, liver, kidney or periodontal disease. Untreated diabetes has been know to cause a sweet aroma both in humans and cat’s breath, meanwhile kidney disease causes more of an ammonia, almost urine like scent. Other issues related to the health of your cat’s gums and mouth that can cause feline bad breath are gingivitis, oral ulcers, an abscessed tooth, tooth decay, and a foreign body lodged in the mouth. The number one symptom of feline bad breath is obviously the foul or bad smell that is coming form your cat’s mouth, however most cat's breath do have a bit of a smell that is not as pleasant as we would like it to be. Below is a list of symptoms that may be occupied with the bad breath to let you know that there is an underlying problem. 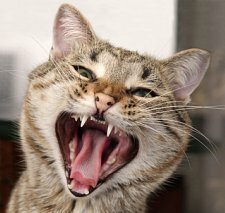 The first course of action for feline bad breath is to take your to their veterinarian. You vet will then be able to do the necessary physical examination of your cats mouth, which may include a blood test to rule out a serious disease such as diabetes. If the cause is due to a parasite infestation, your cat will need to be treated first to get rid of the bad breath. To find out more about treating worms in cats read How To Treat Worms In Cats. If the culprit is due to tooth decay, your vet will have to remove the tooth before feline bad breath is eliminated. Any serious underlying health problems will have to be treated, which may include a change in diet and medication before your cat’s breath improves. In most causes the problem is usually the result of tartar build up, and therefore your vet will recommend a professional cleaning. 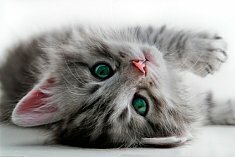 More than 70 percent of cats have dental problems, which can cause severe pain and lead to periodontal disease, so although the professional cleaning will cost a steep $300, or at least that’s what it cost to clean our cat’s teeth, it is well worth the investment in keeping you cat healthy. Your vet may also suggest a change in your cat’s diet, especially if they are only on a wet food diet. I know that the wet food, dry food is always a big debate amongst cat owners, however if you cat does have a lot of plaque build up and is on a wet food only diet, you may want to add dental treats or start using commercial plaque remover products that helps to reduce the amount of plaque that build up on your cat’s teeth.Adding cat-safe greens such as cat grass to your cat's diet can also be beneficially in eliminating feline bad breath. 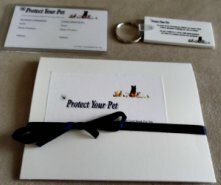 Now I know how difficult it is to brush your cat’s teeth, my husband and I have been bitten a couple of times and have definitely been hissed at, however brushing your cat's teeth is important in preventing cat dental health problems. 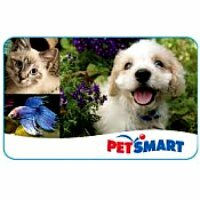 This is a grooming practice that is best to start with kittens so they get used to it, but even with your older cat you can buy a cat friendly tasty toothpaste and a cat toothbrush at your local pet store and start attempting on a weekly basis. To find out how to brush your cat’s teeth read Cat Grooming: Helping Your Cat Look And Feel Their Best. If it is absolutely impossible to brush your cat’s teeth, like it is with our youngest cat, she runs once she sees the toothbrush, then try the commercial plaque remover products for cats. First there are several different brands of gels that you can buy to help reduce tartar and plaque build up. 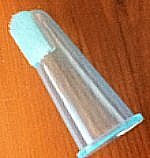 When using the oral gels you do not have to actually brush your cat's teeth with it, a cat owners dream,either place the gel your fingers or your cats paws so that they can lick it off. There are also liquid tarter remover that can be placed in your cat's water to breakdown and remove tarter. 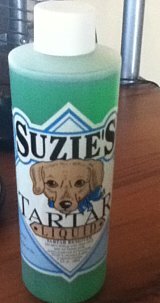 We were using the liquid tartar remover for our cats for a couple of months, it appears to be tasteless since they drink their water without any problems, but to be honest I have no idea if it actually did anything. We do like the gel, it's very simple and easy to use and our cats licked it up. The last time our cats teeth were checked by the vet he said they had no tartar build up, but we do brush our oldest teeth, she actually allows us, and our youngest gets her teeth professional cleaned. However if you are not brushing your cat's teeth it's important to at least try the liquid or the gel, in addition to some dental snacks, it is very easy for plaque to build up in your cat's mouth, which may lead to other health problems. Prevention is key when dealing with feline bad breath. Although there are several different treatments for this problem, but one thing remains the same: a dental oral hygiene routine is important for the overall health of cat. Symptoms And Treatments For Diabetes In Cats -How To Identify And Treat Diabetes in Cats. Feline Acne: Causes, Symptoms,Treatments - Feline acne is much more common than most cat owners realize. Read to find out the causes, symptoms to be aware of and effective treatment options.